Six-year-old Daniela from Romania had her heart healed during our October 2018 Training Visit to Grigore Alexandrescu Hospital (GAH) in Bucharest. Daniela’s family lives in a small city very near Bulgaria and the Black Sea. Her family noticed that she was always tired and not able to keep up with other children her age. They took Daniela to a local hospital for a check up but were told that they could not provide her the necessary care. Her family made the long journey to Bucharest upon hearing that their daughter may be able to receive care at GAH. Daniela was selected as one of 13 children treated during the mission week. Daniela is the 33,000th child to be treated through the Gift of Life Global Network of Caring since 1975. 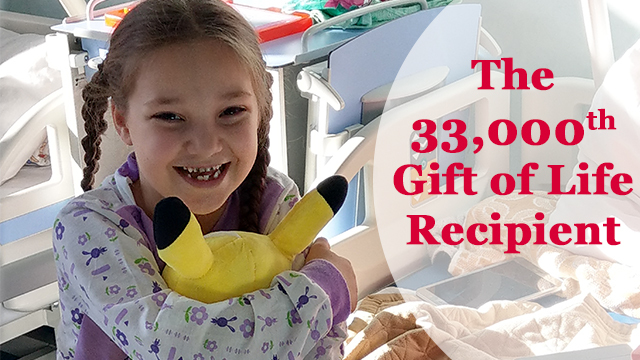 Our 30,000th Child Receives the Gift of Life!